Best suited to light to mid-duty lifting, the overhead crane rope 6×36 construction wire rope we manufacture can be combined with an overhead crane to great effect in a commercial setting. 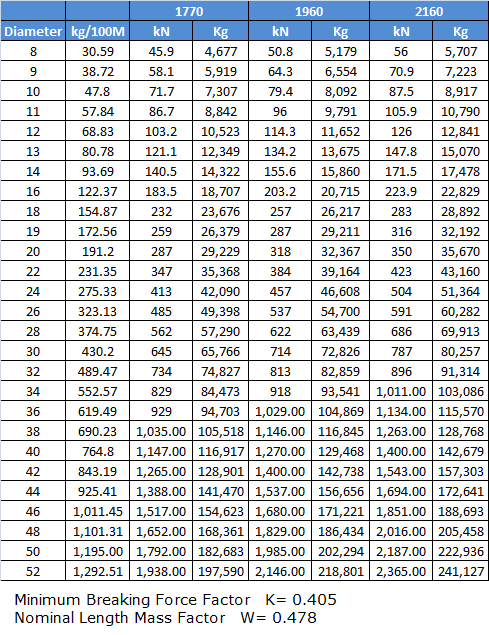 Manoeuvring loads will become simple and achievable at a cost-effective price point. If you are not in need of non-rotating wire rope for the lifting applications you have in mind, then this 6×36 construction product will fit the bill. The six strands of wire on the exterior are wrapped around a sturdy steel core and every part of the rope has been galvanised to minimise the likelihood that corrosion will occur in the short term. For busy manufacturing environments where moisture and other substances might do damage to the metal, this is an important asset for any overhead crane rope to offer. Diameters of between 30mm and 62mm are on offer when you choose this type of wire rope, but remember that there are other options on our site if you are looking for more specialised specifications. The 24×7 construction non-rotating overhead crane rope is a good example of this, combining added stability with extra strength and fatigue reducing wire configurations. There is no reason to fumble blindly through our range of wire ropes for overhead cranes when the Rope Services Direct team is here to assist. Get in touch by phone on 01384 78004 or ask for help through our contact page today! 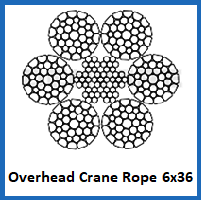 Overhead Crane Rope 6x36 construction Overall rating: 5 out of 5 based on 6 reviews.